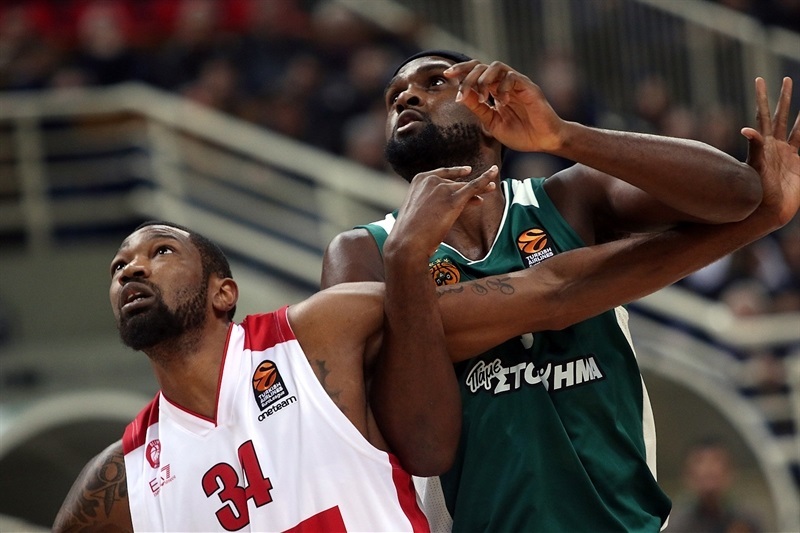 Panathinaikos Superfoods Athens overcame early difficulties to keep its 100% home record intact with an 80-72 victory over AX Armani Exchange Olimpia Milan. 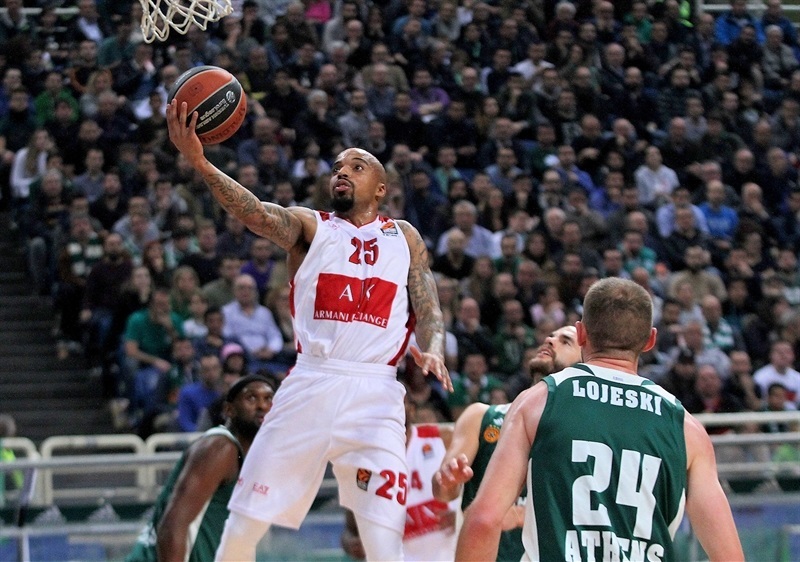 The visiting team was up by 13 points early, but KC Rivers hit five three-pointers in the second quarter to spark Panathinaikos. 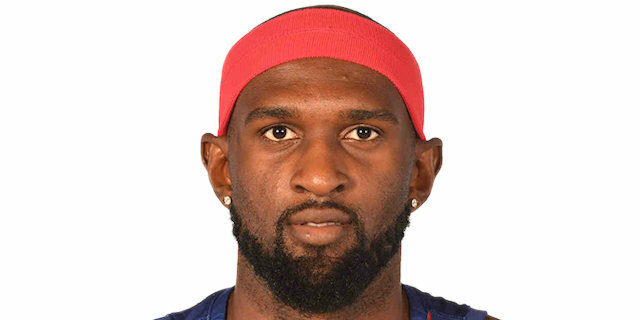 The hosts took charge in the third quarter with another barrage of triples, and there was no way back for a Milan team which welcomed back Andrew Goudelock from injury but lost fellow guard Jordan Theodore for two technical fouls. 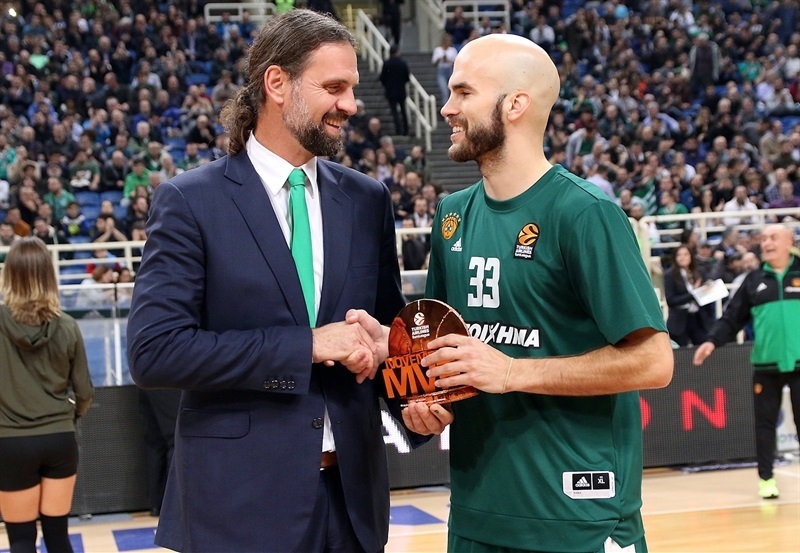 The negative of the night for Panathinaikos was the sight of Nick Calathes heading to the bench, and later to the hospital, with a shoulder injury sustained in the third quarter after contributing 9 points and 12 assists. Rivers led the scoring with 20 points, while Matt Lojeski netted 14 and James Gist added 11 points and 7 rebounds for the winners. The Greens totalled 15-of-28 three-pointers, with seven different players connecting from deep. 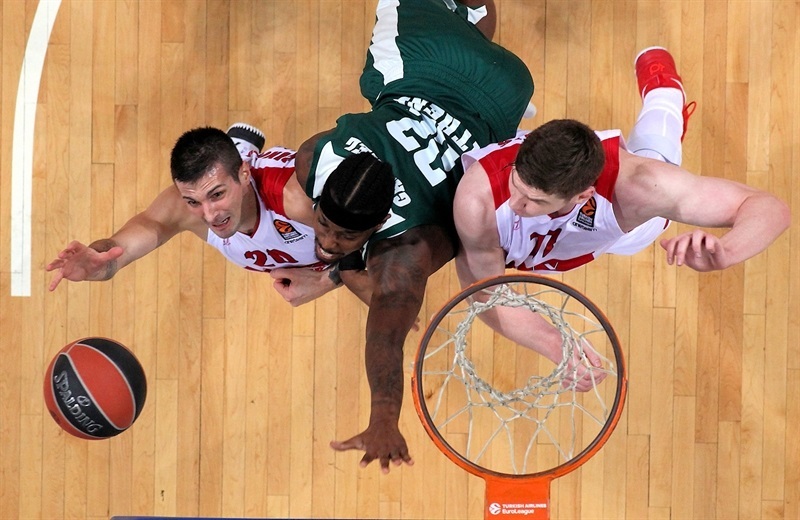 Milan was paced by 13 points from Vladimir Micov, while Arturas Gudaitis scored 11. 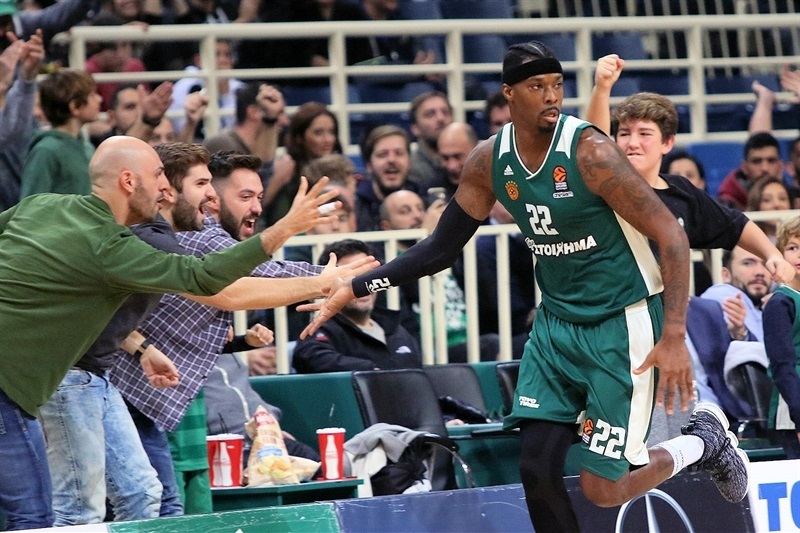 Theodore opened the scoring with a jumper but a trademark alley-oop between Calathes and Gist along with 5 points from Lojeski allowed Panathinaikos to enjoy an 8-0 run. 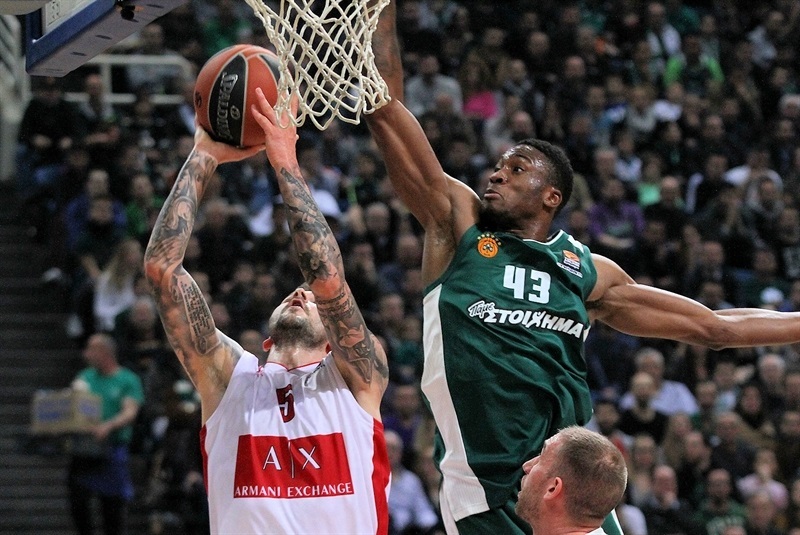 Milan bounced back, with Micov scoring 7 and Cory Jefferson throwing down a two-handed slam on a 2-13 run. 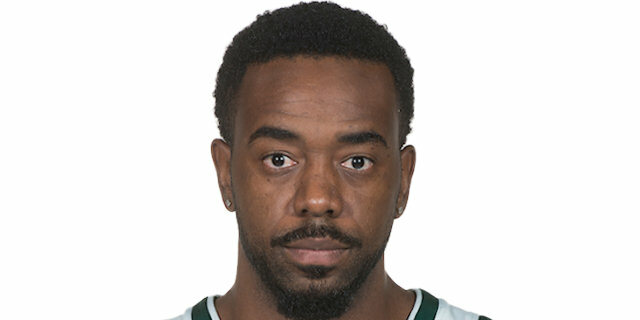 Chris Singleton got the Greens moving from downtown but Milan flexed its muscles again, with Goudelock returning to action for the first time since Round 7 to convert free throws before finding Kaleb Tarczewski for a slam, and it was 14-23 at the end of the first quarter. The hosts found its rhythm at the start of the second as Rivers twice connected from downtown on an 8-0 run. 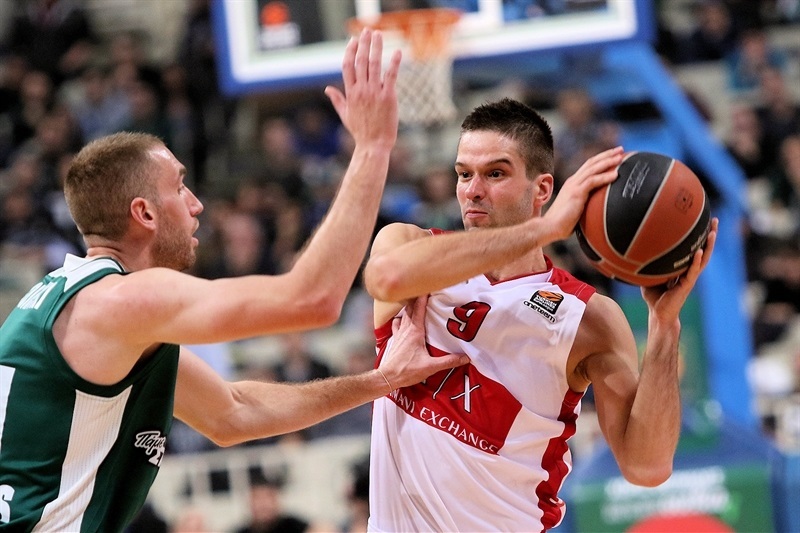 Gudaitis netted a trio of close-range baskets and Curtis Jerrells scored Milan’s first three-pointer for a 24-32 lead, before Amath M’Baye finished a fastbreak to make it a double-digit game. But Rivers hit his third and fourth triples to reduce the deficit to 4 points, and after Micov hit free throws Rivers again struck from long range to make it 39-41 at half-time. 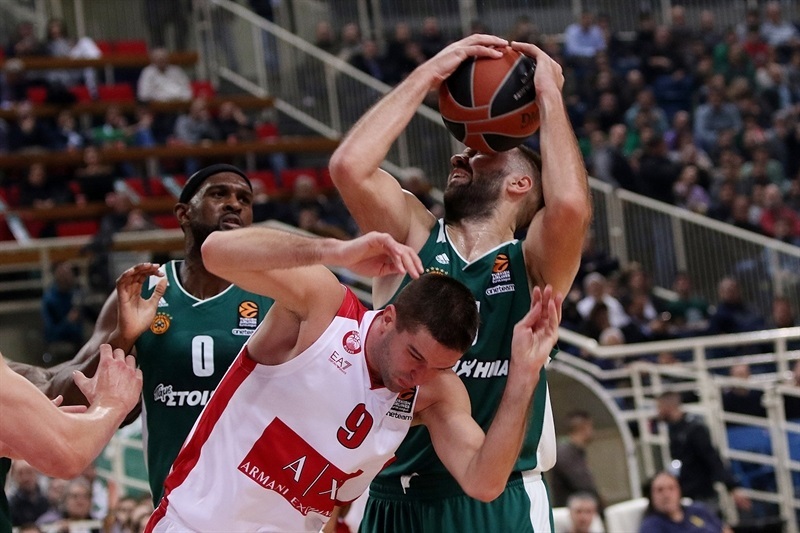 Gist scored a triple and a big dunk early in the second half as Panathinaikos moved ahead, with the lead stretched further by a long-range strike from Lojeski to complete a 10-0 run. 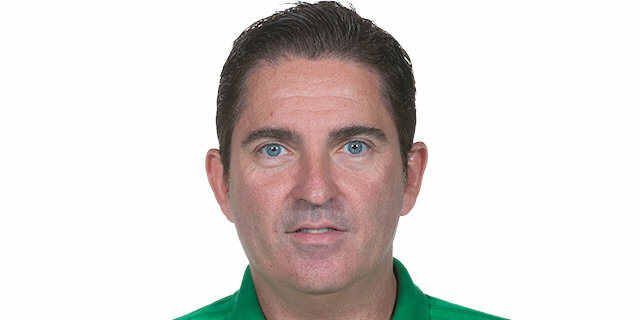 Three-pointers from Theodore and Mantas Kalnietis tied the game, but that was Theodore’s last involvement as he picked up a second technical foul. Then an unsportsmanlike foul was called against Jefferson and Singleton took advantage with another triple, making it 57-51. 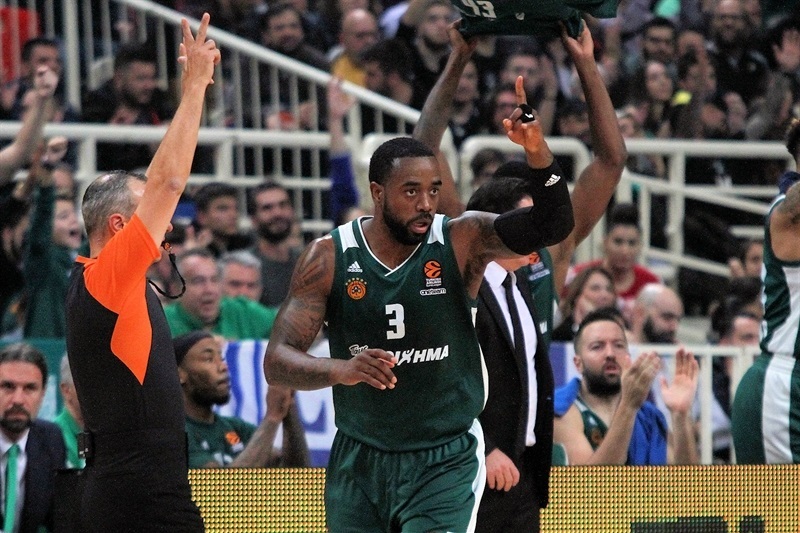 Calathes joined the three-point fun and Gist exploded another dunk, but there was concern for the Greens before the end of the third quarter, which ended at 64-57, as Calathes went to the bench with a shoulder injury. 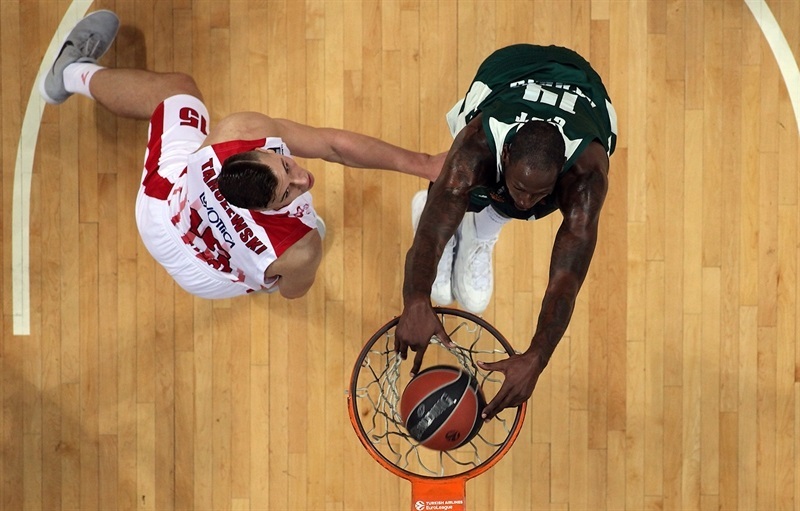 Both offenses struggled early in the final quarter, before Rivers hit his sixth triple and Kenny Gabriel also struck from downtown as Panathinaikos moved into a double-digit lead, and Lojeski added another three-pointer to effectively seal the deal. 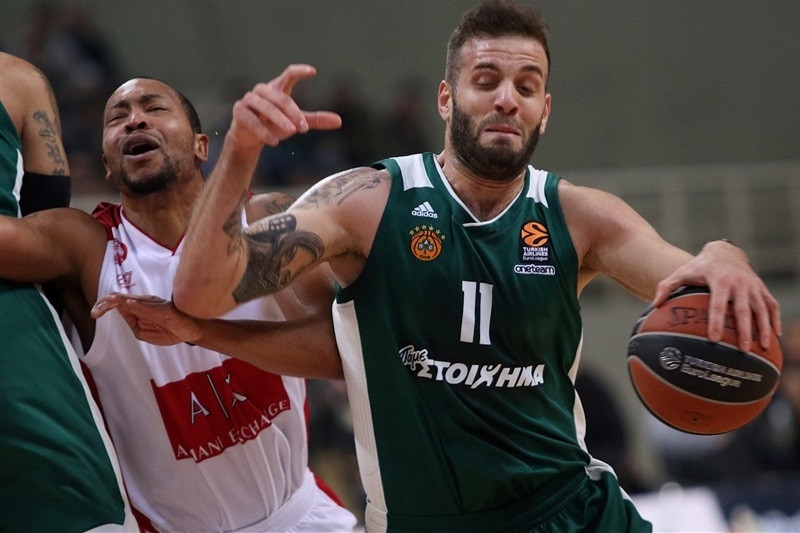 A showtime slam from Gabriel highlighted the closing stages as Panathinaikos cruised home.